Heading into this weekend at the box office, it was expected to be a very close race between last weekend's winner The Secret Life of Pets and Sony Pictures' Ghostbusters reboot. 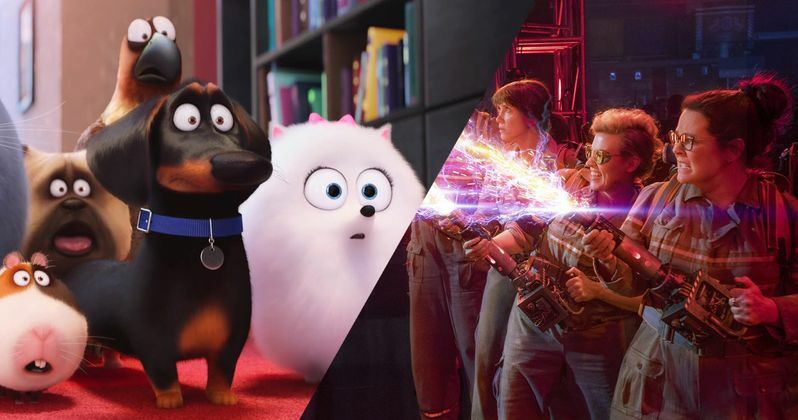 As it turned out, both movies came in a bit under their weekend projections, but it still remained a close race, with The Secret Life of Pets coming out on top with $50.5 million in its second weekend in theaters. Ghostbusters wasn't too far behind, though, with a solid opening weekend of $46 million. We were predicting that Secret Life of Pets will drop 40%, which would would put its second weekend total at $62.5 million, since most animated movies don't drop as much as other summer blockbusters. Box Office Mojo reports that The Secret Life of Pets dropped 51.5% with a healthy $11,541 per-screen average. This animated comedy has now taken in an impressive $203.1 million domestically and another $50.8 million internationally for a worldwide total of $253.9 million. The movie still hasn't opened in key international territories such as France (July 27), Germany (July 28) and China (August 2) yet. For one bustling Manhattan apartment building, the real day starts after the folks on two legs leave for work and school. That's when the pets of every stripe, fur, and feather begin their own nine-to-five routine: hanging out with each other, trading humiliating stories about their owners or auditioning adorable looks to get better snacks. The buildings top dog, Max (voiced by Louis C.K.) a quick witted terrier rescue who's convinced he sits at the center of his owner's universe, finds his pampered life rocked when she brings home Duke (Eric Stonestreet), a sloppy, massive mess of a mongrel with zero interpersonal skills. When this reluctant canine due find themselves out on the mean streets pf New York, they have to set aside their differences and unite against a fluffy-yet cunning bunny named Snowball (Kevin Hart), who's building an army of ex-pets abandoned by their owners and out to turn the tables on humanity...all before dinner time. Ghostbusters makes its long-awaited return, rebooted with a cast of hilarious new characters. Thirty years after the beloved original franchise took the world by storm, director Paul Feig brings his fresh take to the supernatural comedy, joined by some of the funniest actors working today - Melissa McCarthy, Kristen Wiig, Kate McKinnon, Leslie Jones, and Chris Hemsworth. This summer, they're here to save the world! The supporting cast is rounded out by Andy Garcia as the mayor of New York City, Michael K. Williams as Hawkins, Matt Walsh as Rourke, Pat Kiernan as a news anchor and Neil Casey as the human villain Rowan, along with cameos from original Ghostbusters stars Bill Murray, Dan Aykroyd, Sigourney Weaver, Annie Potts and Ernie Hudson. Ghostbusters earned a 73% "Fresh" rating on Rotten Tomatoes, with The Infiltrator scoring a 65% "Fresh" rating on the site. Universal and Illumination Entertainment's Secret Life of Pets was also a hit with critics this weekend, earning a solid 73% rating on Rotten Tomatoes. The opening weekend rollout of 4,370 theaters was the fifth widest of all time, behind Harry Potter and the Deathly Hallows Part 2 (4,375), Iron Man 2 (4,380), The Dark Knight Rises (4,404) and The Twilight Saga: Eclipse (4,468). The top 5 will be rounded out by holdovers The Legend of Tarzan ($11.1 million), Finding Dory ($11 million) and Mike and Dave Need Wedding Dates ($7.5 million). This week's other new release, The Infiltrator, debuted in eighth place with $5.2 million, debuting in 1,600 theaters for a $3,304 per-screen average. The Infiltrator is based on the true story of Robert Mazur (Bryan Cranston), a federal customs and excise agent who lived the high life of Colombia's most powerful cartels while using his undercover alias "Bob Musella," all the while recording damning evidence that culminated in a major takedown at a staged wedding. His target under Operation C-Chase was bankers who manipulated complex international finance systems in order to launder money for drug lords like Pablo Escobar, and ultimately proved critical in the conviction of General Manuel Noriega. The top 10 will be rounded out by The Purge: Anarchy ($6 million), Central Intelligence ($5.3 million), The Infiltrator ($5.2 million), The BFG ($3.7 million) and Independence Day: Resurgence ($3.4 million). Also opening in limited release is Lionsgate's Cafe Society, the latest from Woody Allen, which opened big with $355,000 from five theaters for a whopping $71,000 per-screen average. No box office data was released for A24's Equals, GKIDS' Phantom Boy, Independent's Undrafted and Quality Flix's documentary Hillary's America: The Secret History of the Democratic Party. It isn't known if any of these limited release movies will expand in the weeks to come. Looking ahead to next weekend, Paramount will roll out their long-awaited sequel Star Trek Beyond, which will go up against Warner Bros. thriller Lights Out and 20th Century Fox's animated sequel Ice Age: Collision Course in theaters. Also opening in limited release is Fox Searchlight's Absolutely Fabulous: The Movie, Mirror Images Ltd.'s Beta Test, The Film Arcade's Don't Think Twice, Reliance Big Pictures' Madaari, Strand's Summertime and Well Go USA's Train to Busan. Be sure to check back on Sunday for the box office estimates, but in the meantime, take a look at our projections for this weekend at the box office.